First check your tablecloth to determine its approximate age (see Dating Your Tablecloth section). Tablecloths made prior to 1935 will have dyes that may not be colorfast and may fade or clean unevenly. Watch for any signs of the colors running out of the cloth. The water will be tinged with red, green or orange. Remove the tablecloth immediately and rinse in cold water. Always check your tablecloth while you are soaking or cleaning it to check for fading colors or possible disintegration of the fabric. Line your wash basin with a sheet before filling it with soap. Place larger or more fragile pieces in the basin to soak. When you are through, simply lift the material by the corners to remove from the basin. This will help keep fragile fabrics and linens from stretching or further damage. Do not kneed, twist or push the tablecloth too hard when removing the excess water from the tablecloth. This will further damage and rip any areas where the fabric is thin. Make sure the tablecloth is free from significant wear holes that may be made larger by vigorous washing. I have found that nature is the best bleacher. Hanging tablecloths from a clothesline or laying it outside on a sheet in the grass after washing will do a beautiful job of lightening yellow stains. Make sure that if you hang your tablecloth on the clothesline, you are not stretching the ends. Use several clothespins to hang it straight across the line. First rinse the cloth thoroughly and launder with a an Oxygen product like "Oxyboost". Since this can damage some cloths is should not be used with any cloths containing metallic threads or dyes. Check your cloth carefully before soaking. Take 1/4 c of Oxyboost and dissolve it first in 2-4 cups of the hottest water possible, then take that mixture and add it to very warm water THEN soak your cloths, watching them careful. Sometimes it will take a few trys. It's always better to soak the cloth the shortest time - the small yellow stains will most likely be bleached out when you hang it to dry. If not, then try again! • Detergent: All-purpose synthetic detergent (liquid or powder). Use liquid detergent full strength. Mix powder with water to form a paste when working into stain. • Non-chlorine powdered bleach: Powdered, bleach product such as Bays may be used to remove stains by soaking in tepid water for length of time. Dry-cleaning solvents: Stain and spot removers available at grocery and hardware stores. A nonflammable type is safest to use. • Stain Stick: An enzyme-based cleaner available at grocery and discount stores. Most effective on food, grease, oil, protein, and dirt-based stains and can be used on any fabric and color. It can remain on fabric for up to one week. I found the Carbona® products to be the best at removing specific stains, especially rust. Before and after soaking a cloth. The water can really get that dirty and usually stinks too! If you know what type of stain is on the cloth, the following suggestions are very helpful in removing new and sometimes older stains. Launder with detergent in the hottest water safe for the fabric. If it is a new stain, do not use soap (bar, flake, or detergents containing natural soap), since soap could make the stain permanent or at least much more difficult to remove. If it is an old stain, soak in a solution of water with one half of a scoop of powered non-chlorine bleach. Watch carefully. Soak for at least 2 hours, (more if necessary). Line dry in sun. Soak tough stains for 30 minutes in 1 quart of warm water and 1 teaspoon of enzyme presoak product. The removal of old or set-in stains may require washing with non-chlorine powdered bleach that is safe for the fabric. Always check for colorfastness first. If all the sugars from the wine or alcohol are not removed, a brown stain will appear when the fabric is heated in the dryer or is ironed, as the sugar becomes caramelized in the heat. Treat new blood stains immediately! Flush cold water through the stain and scrape off crusted material. Soak for 15 minutes in a mixture of 1 quart lukewarm water, 1/2 teaspoon liquid hand dish washing detergent, and 1 tablespoon ammonia. Use cool/lukewarm water. Rub gently from the back to loosen stain. Soak another 15 minutes in above mixture. Rinse. Soak in an enzyme product for at least 30 minutes. Soak aged stains for several hours. Launder normally. If the blood stain is not completely removed by this process, wet the stain with hydrogen peroxide and a few drops of ammonia. Caution: Do not leave this mixture on the cloth longer than 15 minutes. Rinse with cool water. If the blood stain has dried, PRE-treat the area with PRE-wash stain remover, liquid laundry detergent, or a paste of granular laundry product and water. Launder using bleach that is safe for the type of fabric. Harden the wax by rubbing with ice. Remove the surface wax by carefully scraping with the dull edge of a butter knife, if that doesn't work, you can try the next suggestion. Sandwich the wax stain between folded paper towels and press down lightly on top of the towel with a warm (not hot) iron. Replace the paper towels frequently to absorb more wax and to prevent transferring the stain to new areas. Continue as long as wax is being removed. Saturate the stain with a pretreatment stain remover. Rub the stain with a heavy-duty liquid detergent and launder in the hottest water safe for the fabric. If it is a new stain, do not use soap (bar, flake, or detergents containing natural soap), since soap could make the stain permanent or at least more difficult to remove. If it is an old stain, soak the tablecloth in a solution of water with one half scoop powered non-chlorine bleach. Watch carefully. Soak for at least 2 hours, (more if necessary). Line dry in sun. If it is an old stain, soak the tablecloth in a solution of water with one half of a scoop of powered non-chlorine bleach. Watch carefully. Look for signs that the dye is colorfast. Soak for at least 4 hours, (more if necessary). Line dry in the sun. Repeat the process if still yellow. Soak the entire tablecloth in a diluted solution of powered non-chlorine bleach. If the stain remains and the tablecloth is colorfast, soak the entire tablecloth in a dilute solution of liquid chlorine bleach and water. Again, test for colorfastness first and watch carefully. Not recommended for tablecloths that were made prior to 1935. Check the "Dating Your Tablecloth" section for clues as to the approximate age. Caution: Chlorine bleach may change the color of the tablecloth or cause irreversible damage especially in PRE-1940s tablecloths. Therefore, it is important to check for color fastness before using. If the stain does not come out within 15 minutes of bleaching, it cannot be removed by this method and any further exposure to bleach will weaken the fabric and remove the color. I do not recommend this for general stain removal. Note: To check for color fastness to liquid chlorine bleach, mix 1 tablespoon of bleach with 1/4 cup of water. Use an eyedropper to put a drop of this solution on a hidden seam in the tablecloth. Let it stand two minutes, then blot dry. If there is no color change, it is probably safe to use the product. Powdered non- chorine bleaches have directions for colorfastness tests on their boxes. There are also a number of dye removers/strippers, which are available in drug and grocery stores. However, color removers will also take out fabric colors as well as the stain so be careful. Mildew is a growing organism that must have warmth, darkness, and moisture to survive. Mildew actually eats cotton and linen fibers and can also attack manufactured fibers, causing permanent damage and a weakening of fibers and fabrics. To treat mildew, first carefully brush or shake off mildewed area. It is very difficult to remove and will damage the value of a vintage tablecloth. PRE-treat the stains by rubbing the areas with a heavy-duty liquid detergent. Then launder in the hottest water safe for the fabric, using bleach safe for fabric. Always check for colorfastness and for the age of the tablecloth before using any type of bleach. Let the item dry in the sun. Badly mildewed fabric may be damaged beyond repair. Old stains may respond to flushing with dry cleaning fluids. Carefully read and follow the instructions on the product label. Removing rust stains can be difficult. These stains cannot be removed with normal laundering. Do not use chlorine bleach, as chlorine bleach will make the stains permanent. Small stains may be removed with a few drops of a commercial rust remover, or by repeated applications of lemon juice and salt on the stain. Do not let the fabric dry between applications. You can also use liquid laundry detergent and oxygen color safe bleach or non-chlorine powdered bleach. If safe for the specific fabric try this old home remedy, boil fabric in a solution of 4 teaspoons of cream of tartar per pint of water. Rinse thoroughly. Rust removers that contain hydrofluoric acid are extremely toxic, can burn the skin, and will damage the porcelain finish on appliances and sinks. Use as a last resort. I do recommend using the Carbona Rust remover products, but again, watch your cloths carefully. Scorching permanently damages the fabric. The heat burns and weakens the fibers, and can also melt manufactured fibers, such as polyester. If the damage is slight you might be able to improve the look. Brush the area to remove any charring. If the tablecloth is washable, rub liquid detergent into the scorched area. Launder. If the stain remains, bleach with an all-fabric non-chlorine bleach. Some of the older tablecloths that have been stored for many years have that "old smell" and yellowing in the creases. You will also find tablecloths that have been in a smoker's home with that "tell tale" smell. I have not had any problems removing either of these problems from my tablecloths. 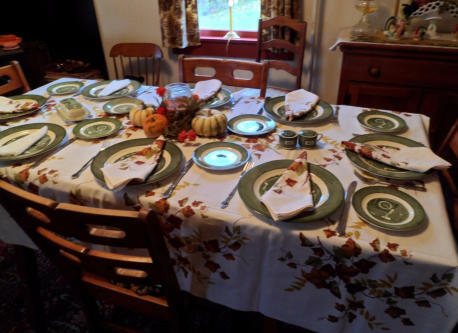 If the tablecloth is not seriously frayed or damaged in any other way, soak the tablecloth is a solution of tepid water and one scoop of non-chlorine powdered bleach or Oxy. Watch carefully for any signs of dyes fading. Remove immediately if you see a green or red "tinged" water. Soak overnight and place outside out all day in the sun. Repeat if necessary, but it should work in one treatment. Saturate the area with pretreatment laundry stain remover. Wait a couple of minutes for the product to penetrate the stain. For stubborn stains, rub with heavy-duty liquid detergent. Launder immediately. If the stain remains, soak the entire tablecloth in a diluted solution of all-fabric powered bleach. Be aware that all the colors may lighten. If the stain persists and the tablecloth is white or colorfast, soak in a diluted solution of liquid chlorine bleach and water. However, be sure to read the tablecloth label regarding the use of bleach. Bleach can damage some dyes and prints, and bleaching damage is irreversible. Also, if the stain is not removed in 15 minutes, it cannot be removed by bleaching and further bleaching will only weaken the fabric. • Detergent: All-purpose synthetic detergent (liquid or powder). Use liquid detergent full strength. Mix powder with water to form a paste when working into stain. • Non-chlorine powdered bleach: Powdered, bleach product such as Bays may be used to remove stains by soaking in tepid water for length of time. Dry- cleaning solvents: Stain and spot removers available at grocery and hardware stores. A nonflammable type is safest to use. • Stain Stick: An enzyme-based cleaner available at grocery and discount stores. Most effective on food, grease, oil, protein, and dirt-based stains and can be used on any fabric and color. It can remain on fabric for up to one week. I found the Carbona® products to be the best at removing specific stains, especially rust. Launder with detergent in the hottest water safe for the fabric. If it is a new stain, do not use soap (bar, flake, or detergents containing natural soap), since soap could make the stain permanent or at least much more difficult to remove. If it is an old stain, soak in a solution of water with one half of a scoop of powered non- chlorine bleach. Watch carefully. Soak for at least 2 hours, (more if necessary). Line dry in sun. Soak tough stains for 30 minutes in 1 quart of warm water and 1 teaspoon of enzyme presoak product. The removal of old or set-in stains may require washing with non- chlorine powdered bleach that is safe for the fabric. Always check for colorfastness first. If all the sugars from the wine or alcohol are not removed, a brown stain will appear when the fabric is heated in the dryer or is ironed, as the sugar becomes caramelized in the heat. Soak the entire tablecloth in a diluted solution of powered non-chlorine bleach. If the stain remains and the tablecloth is colorfast, soak the entire tablecloth in a dilute solution of liquid chlorine bleach and water. Again, test for colorfastness first and watch carefully. Not recommended for tablecloths that were made prior to 1935. Check the "Dating Your Tablecloth" section for clues as to the approximate age. Caution: Chlorine bleach may change the color of the tablecloth or cause irreversible damage especially in PRE-1940s tablecloths. Therefore, it is important to check for color fastness before using. If the stain does not come out within 15 minutes of bleaching, it cannot be removed by this method and any further exposure to bleach will weaken the fabric and remove the color. I do not recommend this for general stain removal. Note: To check for color fastness to liquid chlorine bleach, mix 1 tablespoon of bleach with 1/4 cup of water. Use an eyedropper to put a drop of this solution on a hidden seam in the tablecloth. Let it stand two minutes, then blot dry. If there is no color change, it is probably safe to use the product. Powdered non-chorine bleaches have directions for colorfastness tests on their boxes. There are also a number of dye removers/strippers, which are available in drug and grocery stores. However, color removers will also take out fabric colors as well as the stain so be careful. 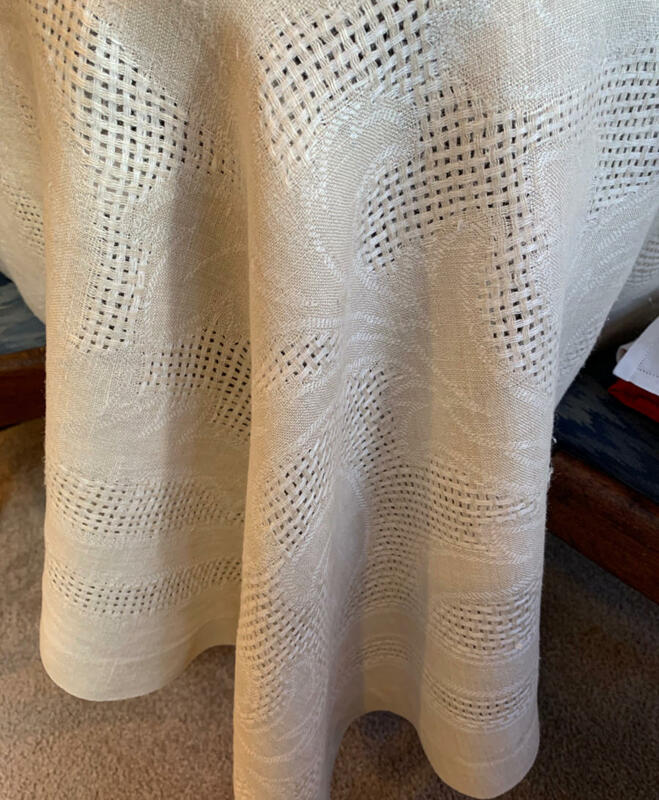 Some of the older tablecloths that have been stored for many years have that "old smell" and yellowing in the creases. You will also find tablecloths that have been in a smoker's home with that "tell tale" smell. I have not had any problems removing either of these problems from my tablecloths. If the tablecloth is not seriously frayed or damaged in any other way, soak the tablecloth is a solution of tepid water and one scoop of non- chlorine powdered bleach or Oxy. Watch carefully for any signs of dyes fading. Remove immediately if you see a green or red "tinged" water. Soak overnight and place outside out all day in the sun. Repeat if necessary, but it should work in one treatment. Saturate the area with pretreatment laundry stain remover. Wait a couple of minutes for the product to penetrate the stain. For stubborn stains, rub with heavy- duty liquid detergent. Launder immediately. If the stain remains, soak the entire tablecloth in a diluted solution of all-fabric powered bleach. Be aware that all the colors may lighten. If the stain persists and the tablecloth is white or colorfast, soak in a diluted solution of liquid chlorine bleach and water. However, be sure to read the tablecloth label regarding the use of bleach. Bleach can damage some dyes and prints, and bleaching damage is irreversible. Also, if the stain is not removed in 15 minutes, it cannot be removed by bleaching and further bleaching will only weaken the fabric. • Detergent: All-purpose synthetic detergent (liquid or powder). Use liquid detergent full strength. Mix powder with water to form a paste when working into stain. • Non-chlorine powdered bleach: Powdered, bleach product such as Bays may be used to remove stains by soaking in tepid water for length of time. Dry-cleaning solvents: Stain and spot removers available at grocery and hardware stores. A nonflammable type is safest to use. • Stain Stick: An enzyme-based cleaner available at grocery and discount stores. Most effective on food, grease, oil, protein, and dirt- based stains and can be used on any fabric and color. It can remain on fabric for up to one week. I found the Carbona® products to be the best at removing specific stains, especially rust.